The most common injury in basketball is a rolled ankle and often appears as a high ankle sprain. With the amount of quick cuts and speedy turnarounds in basketball, it is crucial to protect the ankle. 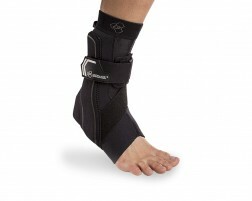 The best type of ankle brace for basketball features sturdy, high-ankle support to prevent lateral sprains. Our bracing experts recommend lace-up, stirrup, and velcro style braces to help you treat and prevent a twisted ankle at your next game. Looking for the best and highest amount of ankle protection on the court without impeding performance? Look no further than the DonJoy Velocity. Learn more about the best ankle brace for basketball players and stay in the game. Ankle sprains can take a long time to completely heal. With a high chance of rolling your ankle while playing basketball, it becomes increasingly important to protect and fully support your ankle. Ankles injuries during basketball usually occur when a player jumps up for a rebound and lands on someone else’s foot on accident or missteps as they come down. Another common occurrence is when the foot gets caught between other player’s feet and the foot is held in place while the ankle is being twisted in another direction. Lastly, it may occur due to ankle instability due to quick cuts on the court. 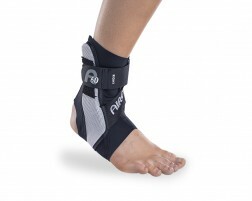 An ankle brace can provide adequate support for a previously injured ankle or for prevention purposes. 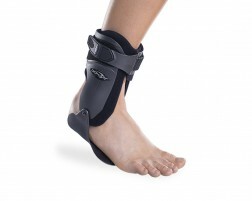 There are a variety of ankle braces based on what you are looking for whether you need more support due to a current injury or something lighter for prevention purposes but still gives the support needed. Not sure which brace is right for you? Learn more about different braces for basketball players to find the right brace or try our Brace Advisor to help you with recommendations based on your needs and usage. Looking for additional support while you play? Browse our selection of basketball braces to protect your knees, wrists, elbows, and more while you ball it up.